Tuffy P is home today, and suggested we catch The Secret Life of Pets early this afternoon. Although I’m not usually gaga for animated films, I was more than happy to find an escape from the harsh reality of violence and hate we awoke to this morning, on hearing about the killings of police last night in Dallas as well as the killings by police in other locations. The Secret Life of Pets turned out to be perfect escapism, charming, funny and suspenseful. There was actually a lot of violence in the film, but it was the kind of cartoon violence which the protagonists shook off as quickly as it happened. The film had pet owners laughing with recognition as it animated the behaviours of our furry friends, which we know so well. It also had some lengthy chases (note to self, don’t let your pets drive) which reminded me of the grand choreographed chases of the last Mad Max film. The Secret Life adventure occurs while all the pet owners are away at work. 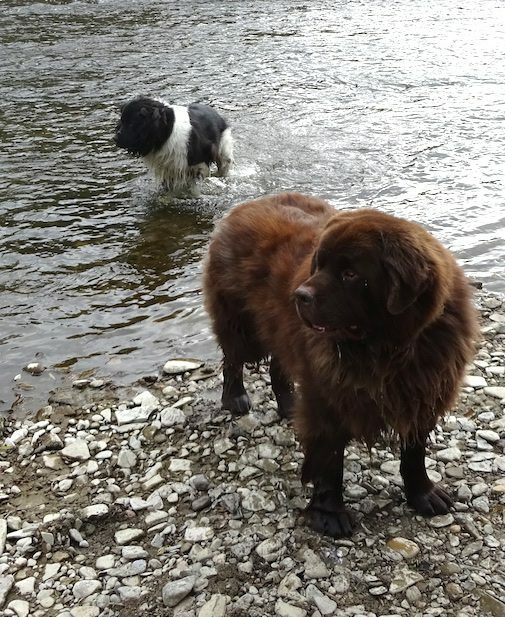 It’s sparked by a new pet in the hood – Max’s human Katie brings home a new dog, a stray named Duke, a giant brown dog who reminded me so much of our goofy Newf Georgie. The two dogs find themselves loose in New York City, leading to all kinds of delightful chaos. Fun story, great animation, perfect music, a wonderful cast of voice actors. This film is loads of fun. Recommended (it might be too intense for younger kids).